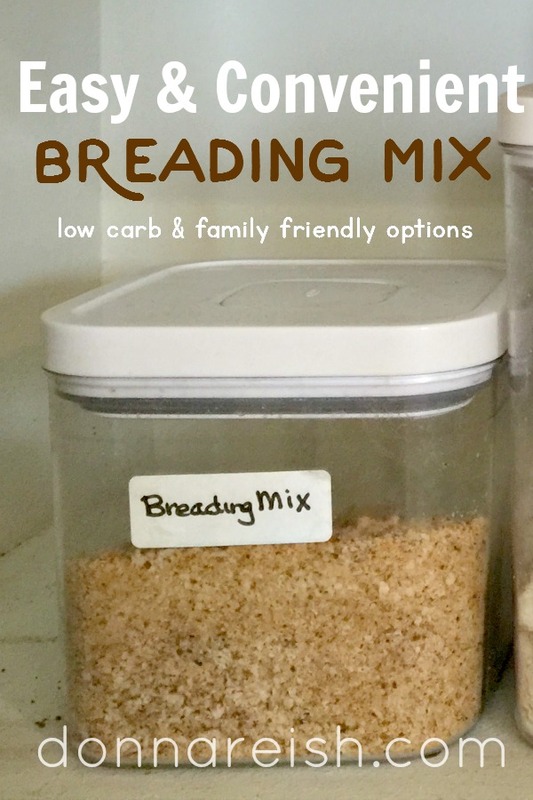 Easy, Convenient Breading Mix – Low Carb & Family Friendly Options! Breading meats (and even vegetables) does not have to a taboo for the low carb cook or the low fat cook or the low calorie cook or the family-friendly cook. We have options! With healthy fats to brush over things, we can pop them in the oven with a healthy breading mix and have chicken nuggets the kids will enjoy. With air fryers, we can bread and fry fish or chicken to our heart’s content—and if we use a lower carb breading mix, we have the best of all worlds: low carb, low fat, low calorie! Use more readily-available, but less than healthy ingredients, knowing that each piece of whatever you are making is going to have less than a quarter of a cup and move on. Or do something in between. Regardless of what you opt to do, this is a super convenient mix to have on hand. I will be posting other recipes, but it is great for breading fish or chicken; cheese sticks or curds (in the air fryer! ); potato wedges and squash quarters; and much more. Yes, an air fryer makes it convenient, but with a little brush or two of olive oil, you can oven fry many things. Additionally, I use this mix for my “filling”—amazing meatballs, meatloaves, salmon patties, tuna balls, and more. Oh, and don’t forget mixing it with a little butter and/or cheese for a rich casserole topping. Did I tell you it was versatile? Joseph’s lavash has four rectangles. These four rectangles yield 1 ½ cups of finely ground crumbs after crisping. One cup of bread crumbs is usually yielded from four slices of low carb bread. For more “panko” style of crumbs, remove the bread’s crusts before pulsing or before drying out. Easy, Convenient Breading Mix - Low Carb & Family Friendly Options! Night before: Lay bread slices all over the kitchen to dry out overnight. OR Toast the slices in a toaster or put in 250 degree oven until toasted or dried out but not so hard they cannot be ground/crumbed. You may also do something similar with low carb pitas or flat breads…you just need to get them “dried” out some. Pulse toasted/crispy bread slices or pitas/flat bread in food processor a few at a time until you have created fine bread crumbs. Note: To use, you may use as is (check each recipe) or add grated Parmesan at the time of using—for each cup of breading mix, add one cup of grated Parmesan cheese. (You may use equal part of the mix above and equal part Parmesan during the “mix making” if more convenient; however, you would need to keep the mix in the freezer (or at least the refrigerator) due to the cheese in it. Because my freezer space is always at a premium, I add my Parmesan at the time I am using each cup of mix. **When determining which “crumb” options you want to include, consider the fact that many of my recipes that call for this breading mix call for half breading mix and half Parmesan cheese (a nearly no carb food). This will further reduce your per cup carbohydrate count when using it. Or you may use this mix as is. +If you do not have All Purpose Seasoning Mix on hand, you may use another all purpose type of seasoning (not a salt substitute as that would be too salty tasting). Alternately, you may also add seasonings instead, such as the following: 1 TBSP pepper, 1 TBSP salt, 1 TBSP paprika, 2 tsp garlic powder, 2 tsp celery salt, 2 tsp dried basil, 1 tsp thyme. Nutrition info for this is based on low carb ingredients without combining it with Parmesan cheese. Serving size is approximately 1/8 cup per piece of chicken or fish. 34 total servings. Carbs will pretty much remain the same if you use half this mixture and half Parmesan. 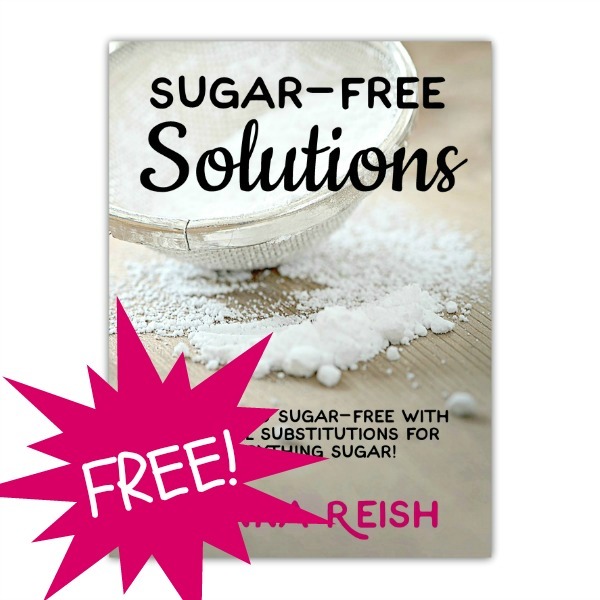 Sign up for blog updates and download my FREE ebook, Sugar-Free Solutions!